Amateur and professional photographers alike are no strangers to packing up and lugging around multiple pieces of valuable equipment. You never know when you’ll stumble upon the perfect photo opportunity—especially while travelling. 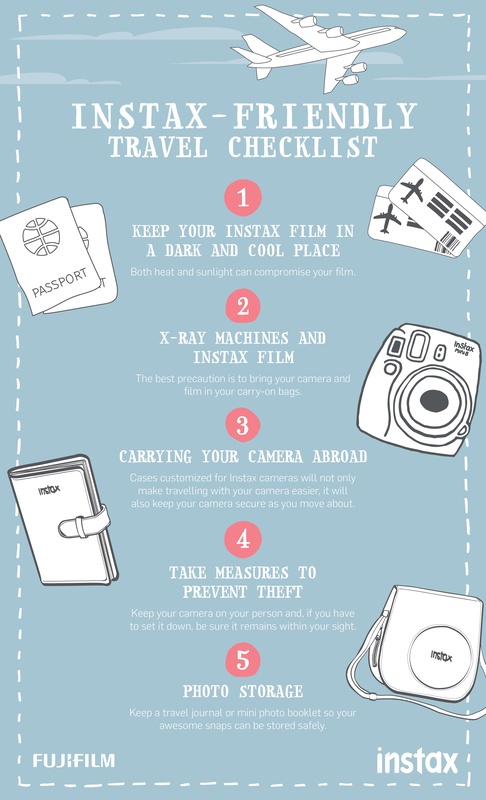 Your Instax is the perfect tool for capturing stunning moments on-the-go, but, when packing your favourite instax camera for your next adventure, you may have a few concerns. Before you hop on your next flight, consider a few of our travel tips (click to make larger). Your Instax camera is designed to be portable and makes the perfect travel accessory. Whether traveling across town or across the world, use the tips above and pack your Instax with peace of mind. Want easy prints on-the-go? Make duplicates for your travel companions, and print directly from your social media profile. Check out the Instax SHARE printer!